Brrrrrrr… it’s cold out there! We even had some snow/ice in Portland, Oregon last week! And cold weather makes me long for warm beverages. In a small saucepan, combine the apple juice, cranberry juice, water, spices (cloves, cinnamon, and nutmeg), honey and sugar. Place pan on stove until starts to simmer and the honey and sugar have dissolved. Remove from heat, add the alcohol, and stir. Pour into glasses, squeeze a few drops of lemon and top with lemon round. If using whole spices, feel free to add a few to the mugs for decoration and flavor. When I am serving this at a party or group dinner, I find it works well to keep it in a coffee pot (after heating) with the warming setting on. Alternatively you could place it in a crockpot (especially for a really large gathering). Please be careful to make sure that the lid is vented so that the alcohol vapors can escape. And safer yet, you can just mix the alcohols separately, place in a small bottle next to the carafe of hot juice, and allow guests to add their own alcohol to the drink (then there is also a non-alcoholic version available as well). For the spices, you certainly don’t have to use whole spices. I find it tastes great both ways, but if using ground spices, beware of the final pour, it can be very spice-heavy. As for alcohol, I typically make this with brandy, but it would be delicious with a large variety of spirits. And a final note on the cranberry juice… I can’t say enough about how delicious the strong, utterly tart flavor of 100% cranberry juice is. If you have only ever tried cranberry cocktail, this flavor may be very strong for you. It is the 100% cranberry juice that really dictates adding so much sugar and honey to this recipe. If you are not able to find 100% cranberry juice (although it is usually very easy to find in the healthfood section of most large grocery stores) you could try substituting cranberry cocktail – but then please omit the sugar and honey. I have not tried this with cranberry cocktail, and the flavor would probably be lost in the rest of the drink. For those of you who have been paying attention, yes, it has been a *very* long time since my last post. I’m very sorry about that. I missed you all! I will try not to do that again! 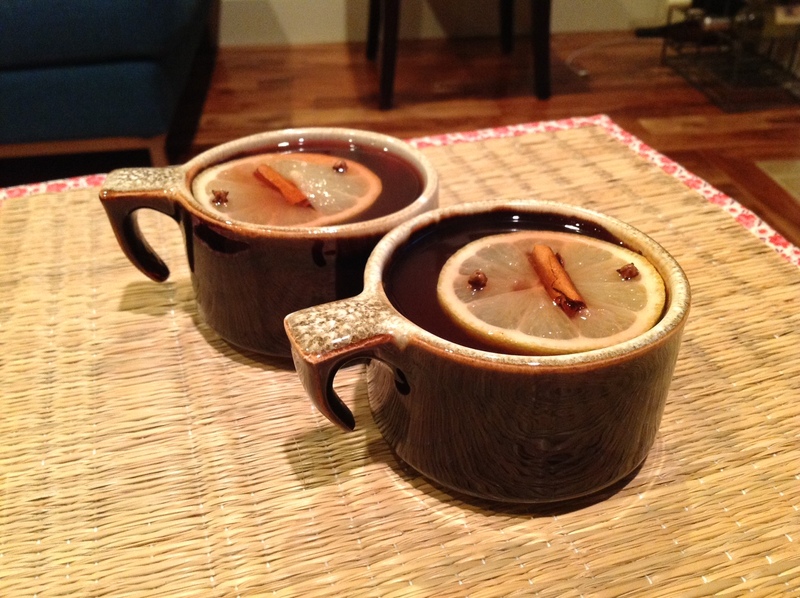 Plus, it is the holiday season… and who doesn’t love infusing booze around the holidays? Categories: Cocktail, Drinks | Tags: apple, brandy, cointreau, cranberry, holiday, holiday drinks, holidays, toddies, triple sec | Permalink. Boozed + Infused on Instagram! Find our infusions on Punk Domestics!